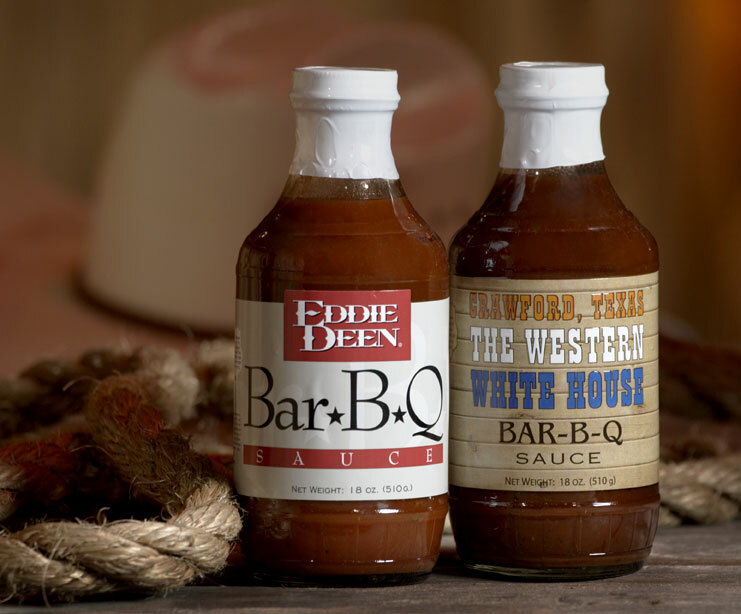 Eddie Deen's signature Bar-B-Q sauce has a historical significance. It has been enjoyed by millions of people from all over the globe since 1980. The sauce was chosen at four gubernatorial and two presidential inaugurations. With the first taste, you will understand the history and the magic in the bottle. The most popular label available is the custom "Crawford Texas, Western White House" sauce. It is #1 in the world as a gift from the President of the United States and you can get it from only 3 sources: From Eddie Deen, from the the Yellow Rose Gift Shop in Crawford Texas, or from the President. Also, custom designed labels that can feature your photo, brand and logo are also available. These make great for attendee gifts! Give someone a little taste of Texas! Go to our Event Form page and tell us how much you need or Contact Us for more information on purchasing Eddie Deen's Barbecue Sauce!